Seagram’s Extra Dry Gin has been continuously produced since 1939. 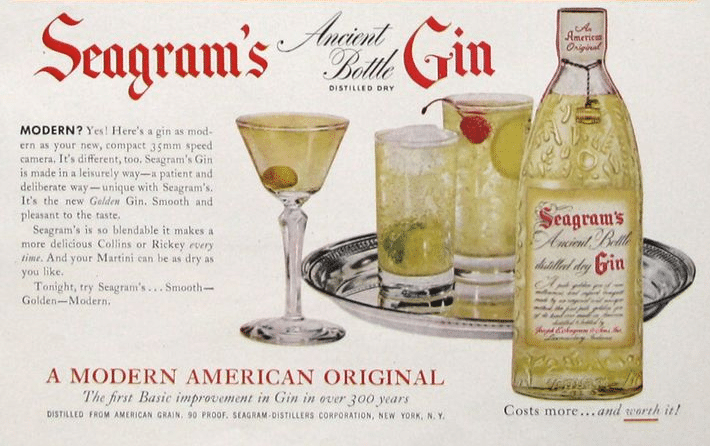 For a long time, Seagram’s Gin was The American gin. Distilled stateside, to this very day— the spirit itself has undergone a lot of changes. Once Seagram’s was more Ancient— aged for ninety days and bottled with a golden hue. Their Ancient Bottle Gin* was a big seller early in the company’s. Over the decades though Seagram’s became Extra dry and by the early 2000’s was merely “rested” in oak. In 2017, the words rested are gone though Seagram’s Extra Dry Gin retains a slight yellow tinge. To modern gin drinkers and fans of golden age hip-hop, Seagram’s Extra Dry Gin holds a special place in their hearts. Before Snoop Dog was selling Tanqueray 10, he was a bit more brand agnostic. He was drinking Seagram’s and Juice. Please let me quote from his 1993 masterwork Gin and Juice. Citrus on the nose with a bit of angelica mixed in with a dull, pine-forward juniper note. The orange seems to be the sweet on the nose with a peculiar candy like edge, as if a candied orange rind. On the palate juniper early, candied orange rinds come on strongly in the mids. Seagram’s Extra Dry Gin finishes with a good dose of heat and some spice notes. Sweetened Cinnamon Orange tea give it a kind of stewed cider like note. Finish is predominantly a bit warm, with bitter pure ethanol receding on the edges of the palate and dwelling there. Seagram’s Extra Dry Gin has long traded on its reputation as an affordable mixing gin. It’s good with juice. I mean, that would mean Mr. Dogg was correct about its role in a Gin and Juice. It works here. The candied orange notes make it an inviting mixer for a Gin and Tonic, with somehow against all odds the juniper coming through. A Gin and Soda is another case altogether where I get far more sweet orange rind notes. Overall, while I don’t strongly recommend Seagram’s Extra Dry Gin for cocktails like the Martini or Aviation, for straight out mixing it’s a good option. It’s a “throw in the cooler and take to the beach sort of gin,” capable of working with anyone’s favorite mixer. Even grapefruit soda, if you’re looking for a Finnish Long Drink. But seriously. Seagram’s Gin has lot a bit of its charm over the years as its shied away from the barrels which initially set it apart. It’s sad because in a sense, had it bid its time— it’s time would be now. Aged Gin is hotter than ever. But otherwise it’s a capable mixer that has a hard time competing against the plethora of other high quality gin offerings on the market. At its price point, it’s not bad; however, these days its hard to recommend. Seagrams has lost some of it's flair over the years I agree I remember the tint from my early years. What I want to know is what happened to their Distillers Reserve offering, it was a real favorite of mine but dont see it much anymore? I just had a G&T poured from the big bottle, and it was getting a bit low. Towards the end of the cocktail, a NASTY bitter taste appeared, one I never tasted before! Strange, but I think I'll stay away from this gin for a while! Great value for the price. Nice botanical flavors like London's Tanqueray & Gordon but at half the price. It's flat, watery and weak. Had to try it, but my first and last bottle. I like my gin strong and clear. No wonder it's the "well" at many places. I think personally it’s womderful. I only drink shots no mixing at all. It’s kinda Hot but the ending note of citrus is nice. My first time drinking Gin and I have no complaints. Take it what’s its worth because I’m a casual 2-3 shot guy and used to prefer tequila until a friend of mine suggest Seagram Gin. The reason it's cheap is that they use "essence" of botanicals instead of sweating actual botanicals. How do you know? Check your headache the next day and your level of dehydration. Having said all that ... in some weird way i particularly like Seagrams in a Salty Dog! Looking forward to trying this very American gin when I get over to the correct side of the Atlantic Ocean! Has anyone here tried the Seagram’s Distiller’s Reserve Extra Dry Gin (black label)? It is only slightly more expensive than the original. I’ve been afraid to try it, since it’s only available in my area in the 1.5 liter bottle. That’s a lot of gin if it’s no good. This is my FAVE gin. I have paid a LOT more for Bombay or the like, and Seagrams is by far the best for the price. I really don’t see why I’d buy anything else, unless I get an itch to spend a lot of money for a questionably “better” gin. I love Seagram’s. Did you mention that it’s yellow? A salesman once told me Beefeater was dry “like vodka.” Sheesh — if I wanted vodka, I’d buy vodka! Seagram’s is mellow and can be sipped straight, but recently I’ve taken to adding a bit of Lillet. Really believe Reserve is one of my favorites. Try this recipe…one persian cuccumber peeled and sliced long. Muddle one half and transfer juice via strainer to cocktail shaker. Cut the other piece of cuccumber in half place in shaker. 2 ounces gin. Juice of one small lime. Put shaker and martini glass in freezer for about 45 minutes. It’s aged in sherry, or so it says, and tastes it slightly and shows it in the color. I like it fine but would not take over some of the really good stuff (Bombay either). I have trouble choosing b/w it and New Amsterdam. Save your money…Reserve is much higher in alcohol content and has a less-mellow flavor. I actually turn to Seagrams any time I’m making a “summer” cocktail like a Tom Collins. The sweetness means I can cut back on how much simple syrup I use. For a martini or gin and tonic, I’ll usually turn to something a bit more expensive, but Seagrams is better than the price tag would imply. After sufficient exposure (trying to describe overdrinking nicely) to NA and its ick citrus, and long fallback flings w Burnett’s and Booth’s, I am back to Seagram, and newly impressed with its smoothness and mellow modulation of peppery juniper etc.